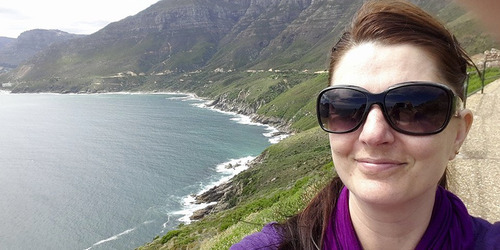 Let us get to know the MOO Chick webshop and its owner, Corenne Tavares, who is based in South Africa. The MOO Chick creates unique, hand-sewn blankets, baskets and bags and sells them worldwide as well as in local shops. Moo Chick is a collection of Udderly Moovelous Handmade Goodness. You’ll find vintage looking blankets and modern crochet baskets as well as Mary Poppins-like tote bags and South African place mats. MOO Chick is a labour of love. I get to sew and crochet for a living! I’ve always crocheted – mainly to keep busy and making things for my family but soon people asked me for specific goodies and with time a business developed. I now make various modern crochet goodies as well as sewing bags, cushions and things for the kitchen and dining room. The brand of MOO Chick is only about a year old but it’s a few years in the making now. Sales started with word of mouth and craft markets and now MOO Chick sells locally and internationally online as well as supplying a few local stores at wholesale pricing. What did you do before you started the shop? Are you doing it full time? If not, what else do you do? I spent 13 years in the corporate world climbing the ladder from the receptionist of a 1-man business to being the Managing Director of clearing and forwarding company. The transition from 16-hour days to mornings only was a hard adjustment – I felt guilty for not working hard enough. My nature to keep busy and do something all the time helped get MOO Chick off the ground with it now being my full time job. I also do the admin and marketing for MOO Chick as well we still doing the admin for my husband’s glass and aluminium business. Do you ever regret doing your own thing and starting your business? I never really liked being told what to do and had pretty low tolerance for authority. Naturally rebelloius I did things my own way which led to quite a bit of confrontation in the workplace. Starting my own business was the best solution for my personality and there’s no regrets whatsoever. I’m the boss now and do things my way without getting into trouble. You make blankets, baskets and more – what’s next on the horizon? I’ll always make the favourites like the blankets and baskets and even the totes, but I look forward to adding new products such as a clutch bag and seasonal goodies like Christmas Stockings. I like using unique and once off fabrics as well to make the sewn items more exclusive.